16 articulating panels can be placed in any number of configurations: stretch them straight for a 13'L blockade or in circle around a hazardous area. Includes (2) 5" non-marking wheels and (4) locking straps. 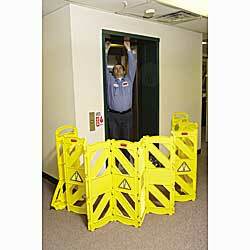 Open dimensions: 13'L x 1"W x 40"H; closed dimensions: 2'L x 13"W x 40"H. Color: safety yellow. IN STOCK.